There are less delightful stories out there and a lot of women struggle on their journey because of the negative comments from friends and fros. 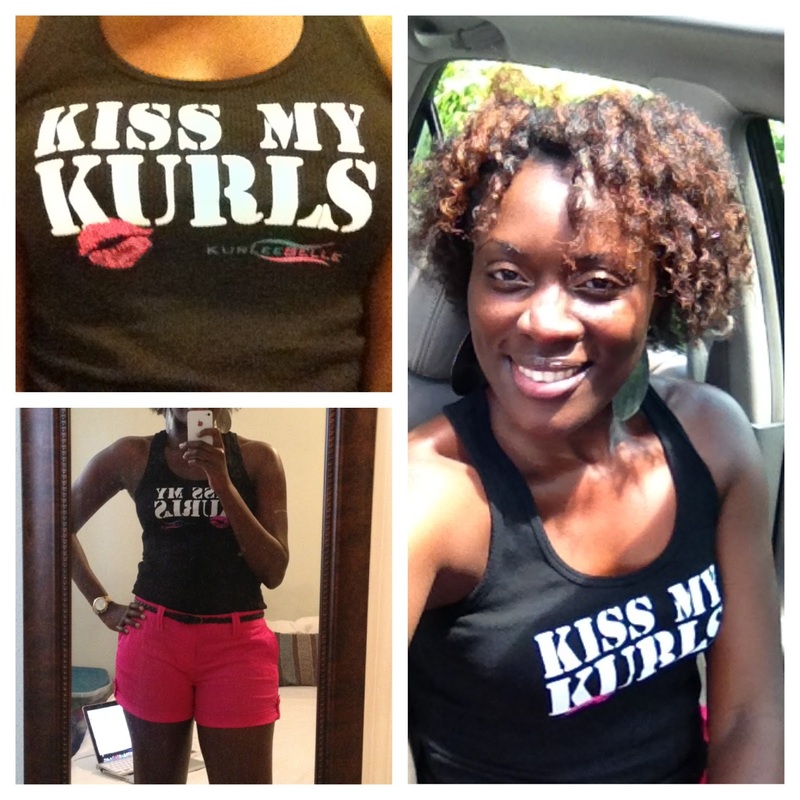 The idea behind the "Kiss My Kurls" t-shirt was to combat those negative comments. 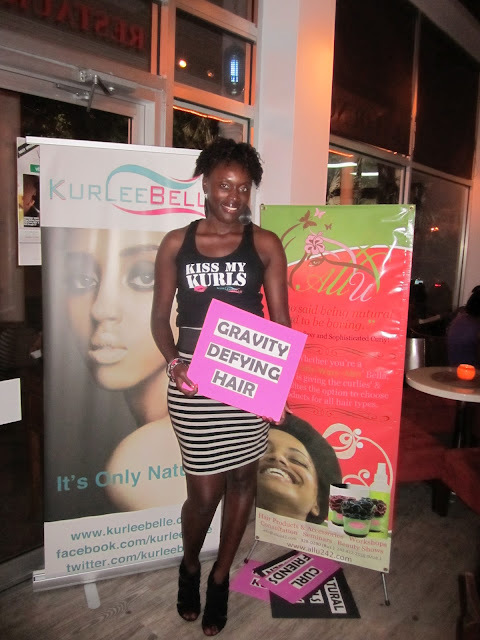 By uplifting those on their journey, who struggle with negative comments about their hair. 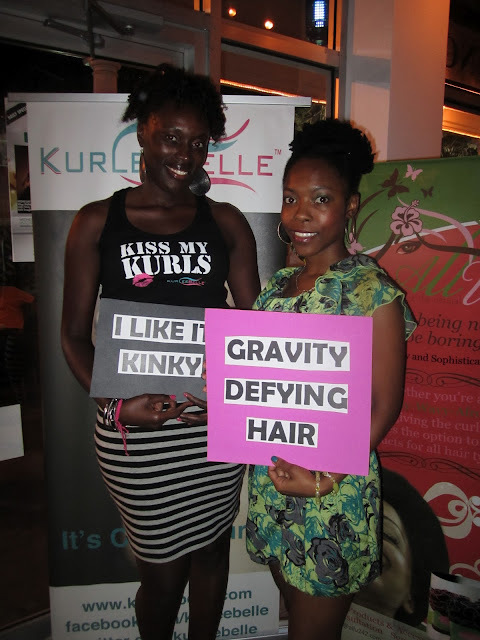 Kiss My Kurls which is comparative to Kiss My A$$, tells the world that "I don't care what you think about my hair. It is on my head and not yours..so you can kick rocks! Most of the bashing that I've received when it comes to my hair are from relaxed or weave haired women. I can't seem to figure out what it is that they have a problem with...Are they bashing my hairstyle, hair texture or overall look? But to be honest, the only opinion that matters is my own. 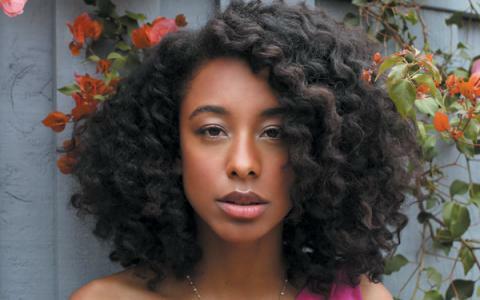 Corinne Bailey Rae said it best...."There's a lack of confidence when it comes to relaxing your hair. It's like you're saying, 'My hair is not right in some way.' As though other people will think it's weird, or that you won't fit in." It takes a lot of confidence, patience and courage to go natural. We not only have to deal with negative comments from those around us but the struggle of caring for our new found hair. Finding a style that suits our face, mastering the art of twisting, tucking and knotting, and finding products that work for our hair texture. If these women knew what we really went through, I believe they would think twice before opening their mouths. 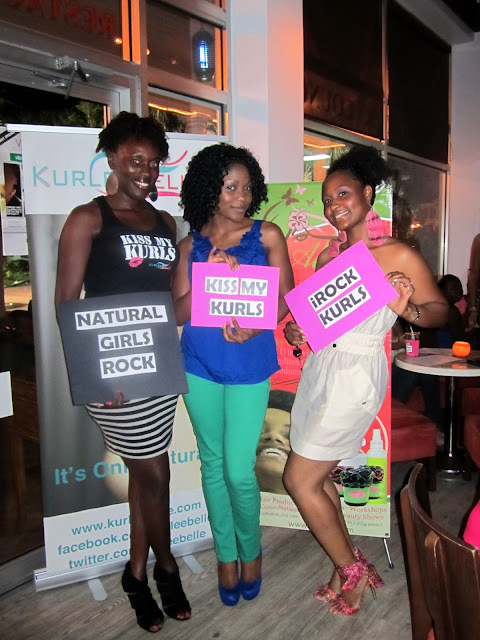 As a new natural, it is important to join a support group to gain encouragement on managing your hair texture. There is this common misconception among the natural hair community that rainy days are a breeze or you don't really need an umbrella. Well I'm not sure if it's the entire community that thinks this way. But for a long time, I've thought this way and I was so wrong. It has been rainy for the past two weeks and with rain comes lots of humidity. 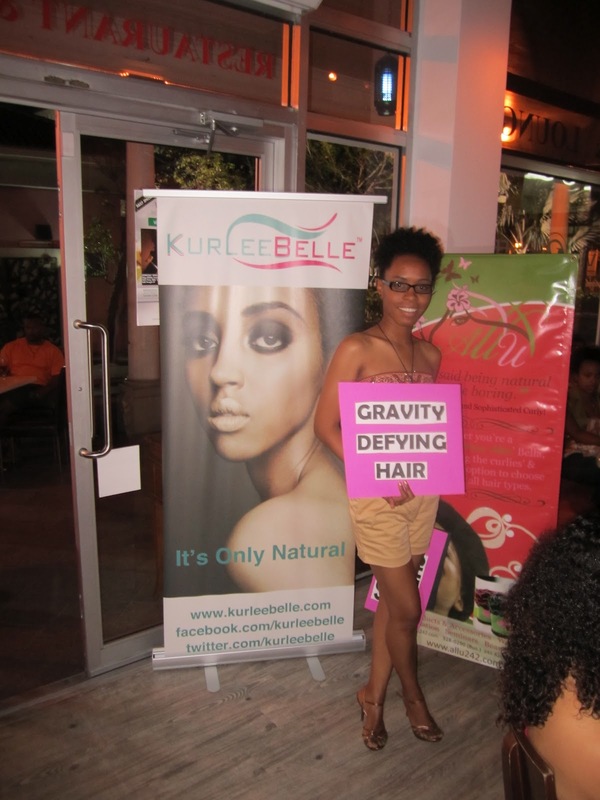 If you've been natural for an extended period time, then you know that humidity is not a natural girls friend. A great way to fight frizz in humid weather is to make sure that your hair is hydrated. 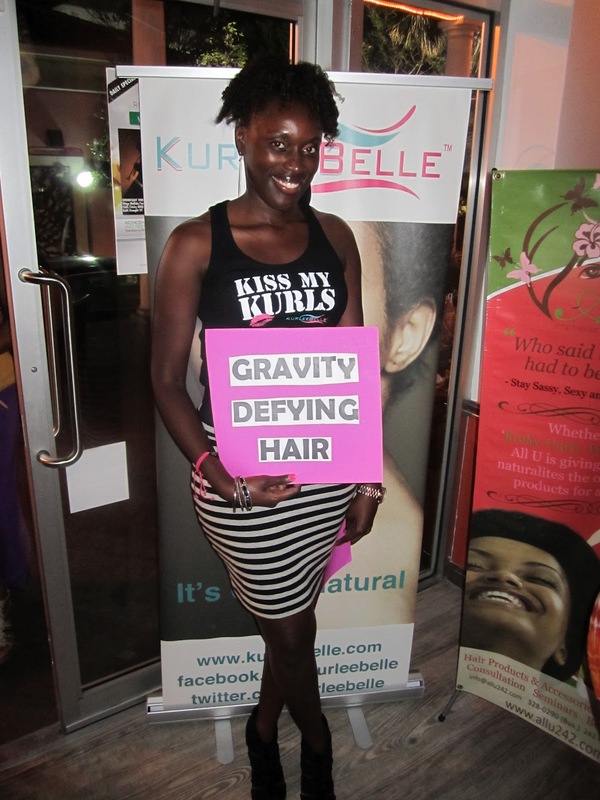 This can be achieved by drinking lots of water, using a water based moisturizer and regularly deep conditioning . Just like a sponge will expand in water, so will dry hair in humid weather. After spending 30 minutes creating little bantu knots the night before. I woke up to a less than perfect bantu knot "poooooffed" twist out. The reasons why my hair frizzed out when I hit the streets, was because it wasn't moisturized enough and it didn't completely dry during the night. By the end of the day, my hair was a huge poooooff ball and I literally looked like the bride of Frankenstein minus the white lighting sign. I had dinner plans with a friend later on that night and didn't have time to go home, much less do my hair. Lucky for me, I had my "Natural Hair Emergency Kit". If you don't have an emergency kit you A) Are a celebrity that walks around with a personal stylist in her back pocket or B) Just don't give a D. Ok, I'm just kidding but every natural girl should have a Natural Hair Emergency Kit just in case.....that hairstyle you worked on all night is less than perfect by the end of the day. Bobby pins- These are a life saver. No matter how bad the curl pattern from the 4-day old twist out, bobby pins can make any style look like it's on purpose. 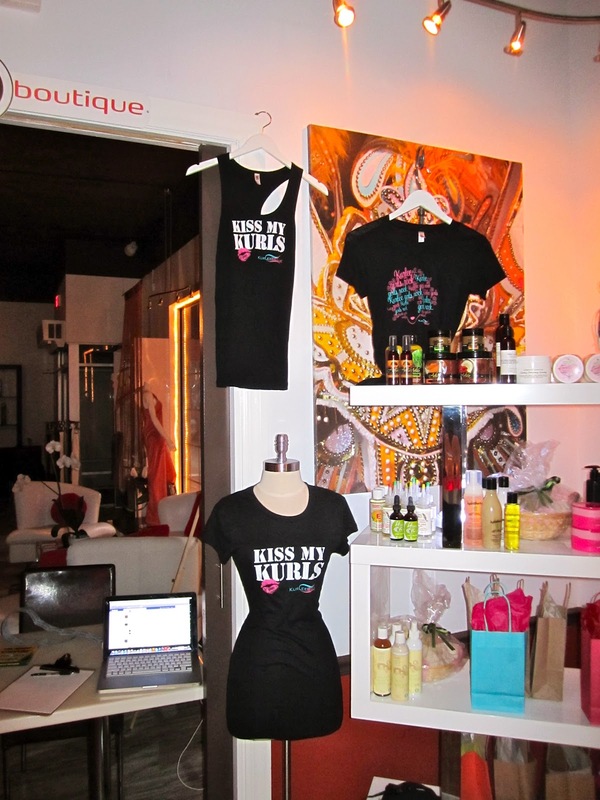 Mini spray bottle filled with water- water is the hydrator and can be used to tame dry frizzy hair...need I say more. Non Slip Elastic Bands- These are absolutely a MUST have for me. I'm the type that likes to be in control. Always wearing a headband allows me to shape my afro and maintain control of my rebellious hair. Small jar of curl creme/gel- for the obvious purpose of moisturizing or slicking the hair. Hair Clips- to keep the hair separated while styling. Small pop up brush- for smoothing and control. Hair pick- To create a symmetrical afro. Wide tooth comb- to help with detangling if need be. The majority of these items can be found in the 99 cents aisle at Target or Walmart. The smaller the items, the better. A plus of having a Natural Hair Emergency Kit is the fact that it can be used as a travel kit. A slightly large make up bag can be used to store all items. 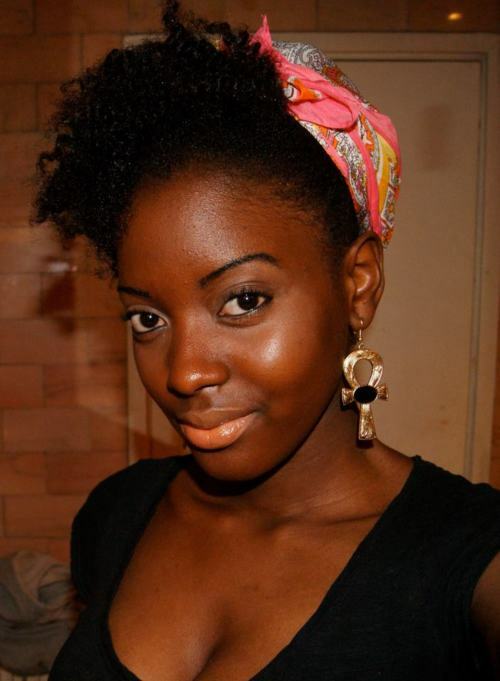 Do you own a Natural Hair Emergency Kit? Are there any items I missed? When I'm flying there is absolutely one thing that I must have stashed in my carry-on....and that's a copy of InStyle Magazine. I love the smell of a fresh magazine and the way its' crisp pages feel between my fingertips. But most of all, InStyle's pages are full of new and fresh content that always leaves me drooling for the next issue. This time around, I decided to pick up InStyle Hair. Which to my surprise was as delightful as InStyle which focuses mainly on Fashion & Beauty. In the Special Spring 2012 Issue of InStyle Hair there is a feature on celebrities: Yaya Dacosta, Solange Knowles & Corinne Bailey Rae. The title of the excerpt is called "Natural Wonders"...sub-titled- "How three curly- haired beauties learned to stay true to their roots." The article is quite delightful and shares products, tips and hair stories from the three lovely ladies. Hair Story: Yaya who has never had a relaxer, shared her hair story about being ridiculed as a little girl because of her natural hair. Not succumbing to others version of beautiful hair, she joined a group of girls with natural hair and came up a list of commandments. One of the commandments being, " I will never relax my hair." 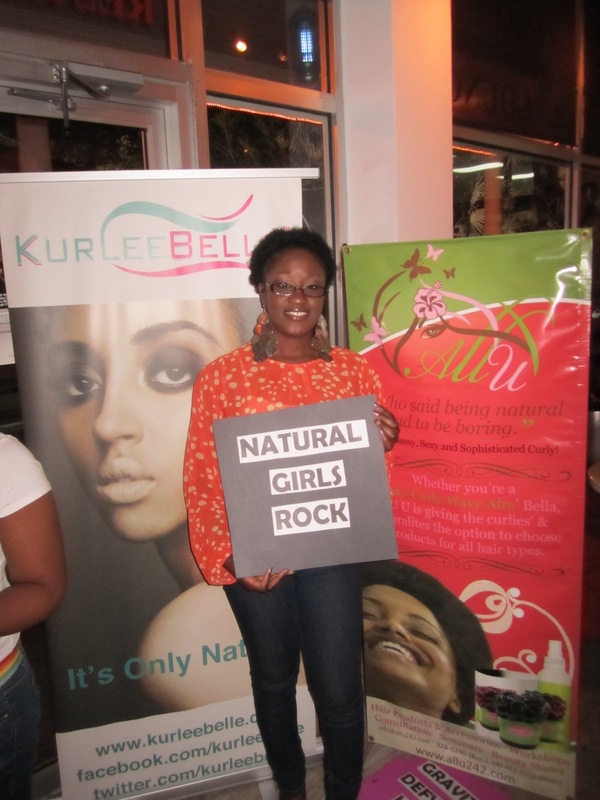 New naturals should take a page out of Yaya's book, by finding a natural hair support group. There is nothing like positive energy when you're undertaking a new venture. 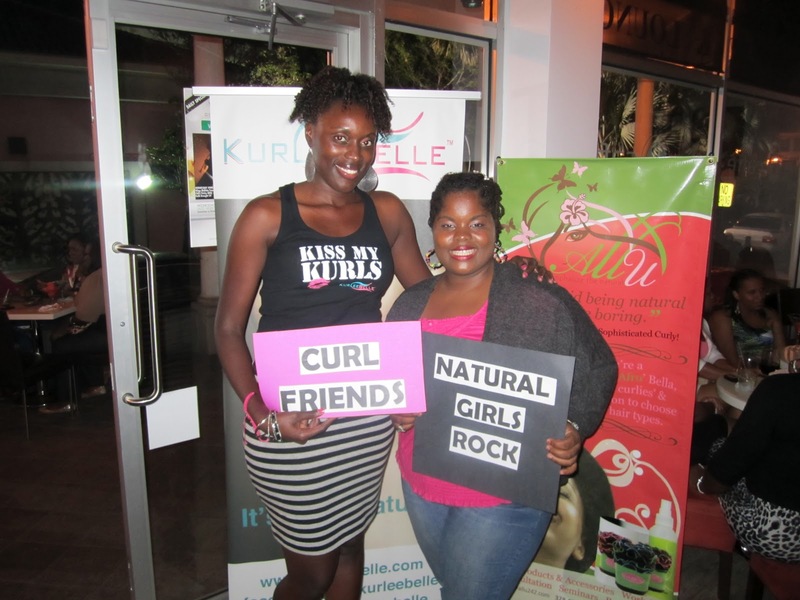 The natural hair journey can be difficult, so it's important to find women who share your views and struggles to keep you on the right track. Hair Secrets: Yaya makes her own shampoo and conditioner from essential oils. To keep her hair shiny and healthy, she massages coconut oil onto the roots and ends of her hair every day. Product Must Haves: Goody Ouchless shower comb, 365 Everyday Value Organic Pressed Virgin coconut oil, and Sedu revolution pro 6000i dryer. Hair Story: Solange shares her childhood memories of her and sister Beyonce in their mom's salon. She doesn't take her hair too seriously and says how she dyed it bright Crayola red and had to chop it all off because of breakage. 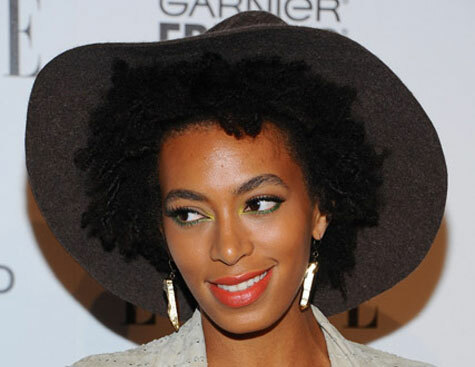 Solange loves the versatility of natural hair and hasn't had a relaxer since she was 15. In the article she quotes, " I'm not a poet just because I have an Afro!" Which is a common misconception of women with natural hair. Hair Secrets: Before shampooing, Solange usually detangles her hair with a wide tooth comb to prevent strain and breakage. After shampooing she applies conditioner, covers hair with a plastic cap and sits under the dryer for 15 minutes. Twice a month she does a hot oil treatment using pure coconut oil which stops the hair from shedding and breaking. Solange admits that most of the time she gets extensions or wears wigs because she doesn't want to damage her natural hair. Product Must Haves: Goody Quickstyle detangling comb, Carol's Daughter Black Vanilla Moisturizing Shampoo, Hesh Coconut Perfumed hair oil and Carol's Daughter Black Vanilla Moisturizing Hair Smoothie. Hair Story: Corinne gives us a little insight into British culture by stating, 'Most young black girls in England wear their naturally curly hair.' She didn't get a relaxer until age 13. She accidentally stumbled back over to #teamnatural when her hairstylist was too busy to give her a relaxer. Corinne loved her new curly look and found that it was less expensive than getting a relaxer. In the article Corinne brought to light a deeply rooted issue that black women struggle with when it comes to their hair. She says, " There's a lack of confidence when it comes to relaxing your hair. It's like you're saying, 'My hair is not right in some way.' As though other people will think it's weird, or that you won't fit in." I totally agree with Corinne. 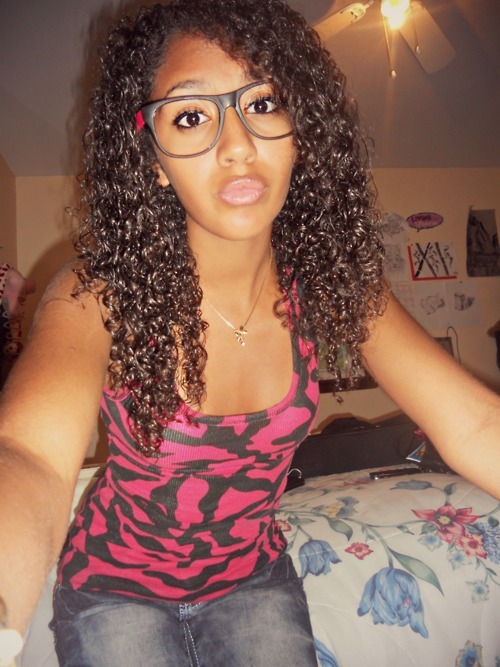 Since I've been natural, I see myself differently and wouldn't trade it for anything. My only regret about "going natural" is that I didn't do it sooner. Hair Secret: Corinne washes her hair every 9 days focusing mainly on the roots since the ends are drier. After shampooing, she applies a conditioner, covers her hair with a plastic cap and reads a book for an hour while the conditioner soaks in. Detangles with a paddle brush and applies pomade. To achieve her signature look, she sections her hair, curls each section with fingertips, bobby pins and lets hair air dry. She never uses a hair dryer because it makes her hair big and bushy. Product Must Haves: Aveda wooden paddle brush, Aveda Shampure Shampoo, Rahua conditioner, Goody colour collection bobby pins, and Black &White Genuine Pluko Hair Dressing pomade. What are your hair stories or secrets? Do you use any of the products mentioned? I am loving Brandy's new look! 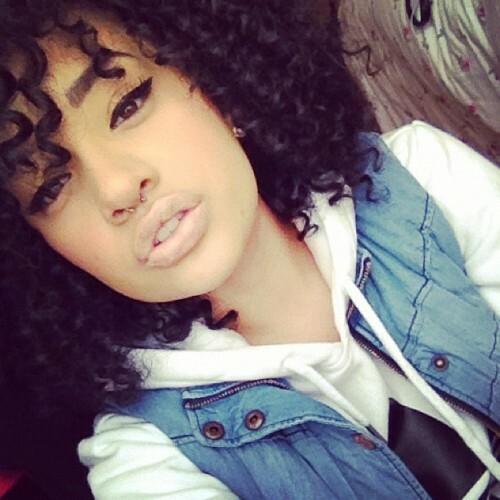 She has me thinking about getting a sew-in for the summer. How do you like Brandy's new look? OMG! National Natural Hair Meet Up Day in The Bahamas! National Natural Hair Meet Up Day is a one day annual event where women with natural hair get together to network, share hair stories, discuss products, styling tips and hair care tips. This event which is held mainly in the US was also held in The Bahamas! 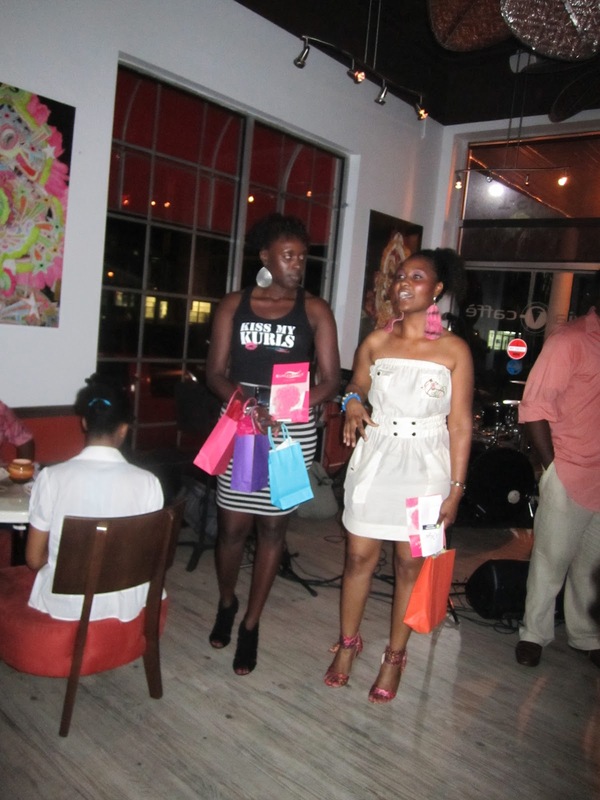 After seeing all of the buzz on twitter, I decided to team up with my friend Lashona Knowles of All U Natural Hair along with Via Caffe and host the event in The Bahamas! The turn out was phenomenal! 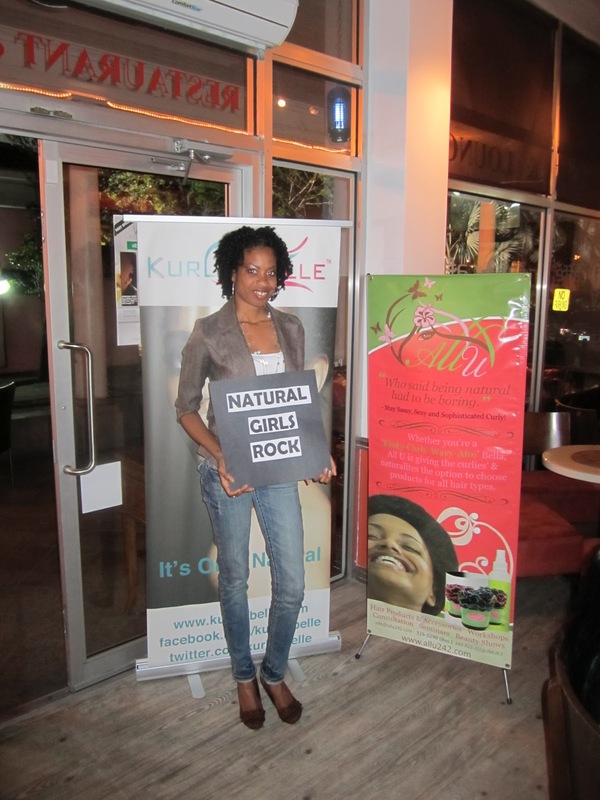 Lots of Bahamian Naturals came out to support the event and Mix and Mingle. 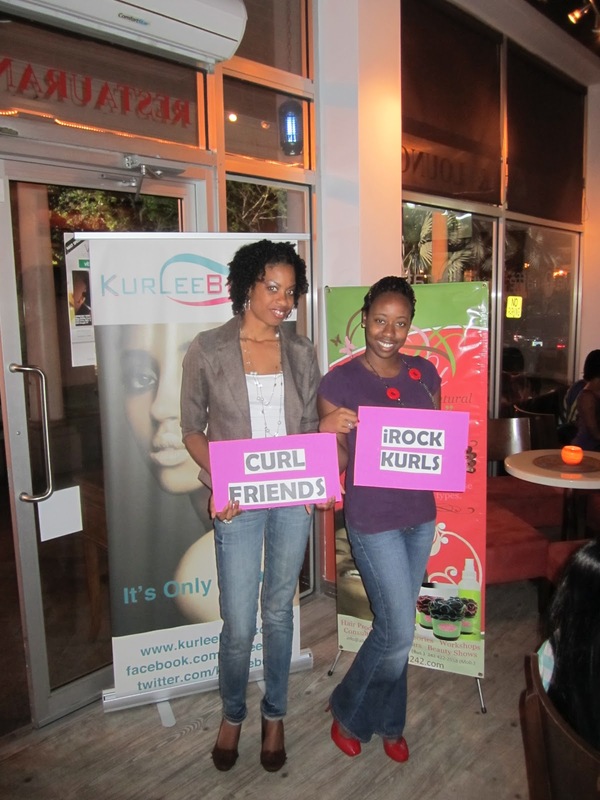 To give you a recap of what went on: Ladies were greeted at the door by our fabulous volunteers with a Kurlee Belle & All U Natural Hair Trivia questionnaire as an Ice Breaker! The first 50 ladies received a free treat which consisted of a special non alcoholic beverage and/or an alcoholic beverage. 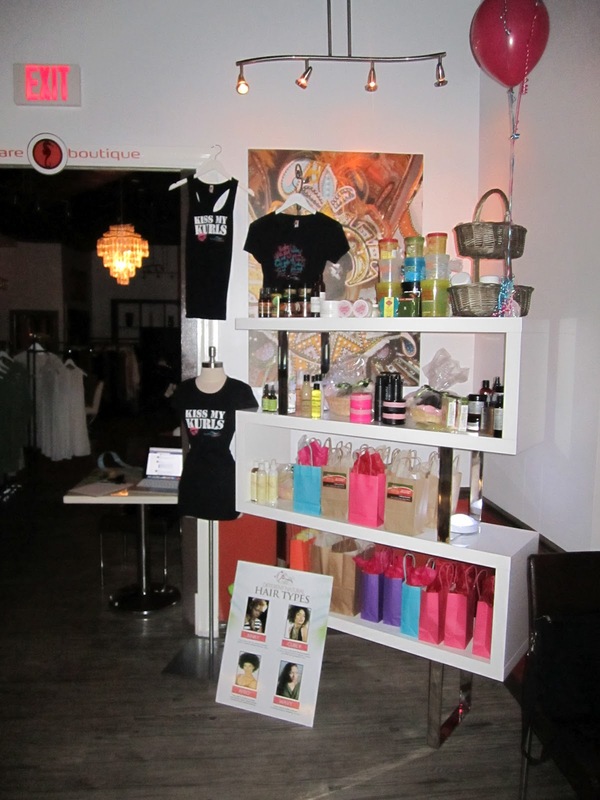 Throughout the night, there were raffle prizes which consisted of a Melissa Chanel T-shirt Giveaway, All U product samples, Product Junkie Bags, and Kurlee Belle Beauty Giveaway Bags! During the event ladies enjoyed various cocktails and yummy finger food from Via Caffe's delicious menu! The ladies had a great time taking photos in front of the Kurlee Belle and All U banners with fun props! Special thanks to Dawn and Maria from Via Caffe! These two ladies are AMAZING! Special thanks to our volunteers & Kristenell Fowler, my Aunt Pammy, sisters Adassa & Tasha and Cousin Kenya who came out to support Kurlee Belle!